Voltaire was born in 1694 in Paris of the middle class family, and his father a lawyer. Voltaire in his youth studied at the Jesuit college Louis-le-Grand in Paris. After that he briefly studied law but later abandoned. As a teenager in Paris he was known for intelligent, clever humor and high level burst from his lips the words satire. Under the ancient regime of the old alias, such behavior could be a risk. And sure enough! Because the utterances that contain politically he was detained "secured" in the Bastille prison. Almost a full year he was curled up in there. But he is not as stupid as the government sent him. He's not dumb stare like a stupid person, but disibukkannya himself by writing poems Henriade heroism that can then be a high honor. In 1718, shortly after Voltaire breathe free air, his Oedipe diprodusir drama in Paris and won a great success. At the age of twenty-four years had become the famous Voltaire, and the remaining sixty years of his life he really so expert French literature. Voltaire had a rare double intelligence: smart money and smart in a relationship in relation to speech. No wonder the level by level he becomes a free-living with a bag full of money. But in 1726 he was in trouble. Voltaire has established itself as an intelligent and brilliant in argument, not only in size to the size of his era but probably of all time. But, he is less outgoing and humble by the French aristocrat who was considered a requirement that must be owned by one most like him. This led to conflict between Voltaire with the aristocratic, especially Chevalier de Rohan who was defeated by intelligence Voltaire said in a penalty. After a long, Chevalier hired artisans to make over at Voltaire and put him again into the Bastille. Voltaire was released from there on the condition he had to leave France. Therefore he decided to cross to England and lived there for two and a half years. He lived in England apparently was a turning point in the life of Voltaire. He learned to speak and write in English and therefore become familiar with the works of famous British people like John Locke, Francis Bacon, Isaac Newton and William Shakespeare. He was also personally acquainted with most astute scholars of British era. Voltaire had been impressed with Shakespeare and British science and empiricism, the schools are adhering to the need for a trial in practice rather than merely adhering to the theory. But, of all that the most impressive was the British political system. British democracy and personal freedom that suggests the very opposite of what Voltaire saw in France. There was no English gentleman could spend letre de Cachet Voltaire can throw into jail. Because, if ever he was arrested arbitrarily, order the immediate release obtained. When Voltaire returned to France, he wrote his first philosophical Lettres philosophiques commonly called Letters on the English. The book was published in 1734 is a true sign of renewal of the French era. In the Letters on the English, Voltaire presents a nice overview of the British political system following the thoughts of John Locke and other English thinkers. Publication of the book make the rulers of France and furious once again Voltaire was forced to withdraw from Paris. Voltaire spent fifteen years in Cirey, a town in northern France. There he became the lover of Madame du Chatelet, the wife of a marquis (nobleman). Intelligent and educated lady. In 1750, a year after his wife's death, Voltaire went to Germany at the invitation of Frederick the Great of personal Prussia. Voltaire lived three years at the residence of Frederick in Potsdam. At first he was matched with Frederick the intellectual and brilliant, but in 1753 they quarreled, and Voltaire to leave Germany. After leaving Germany Voltaire settled on a farm near Geneva. There he could be safe from interruption of the kings of France and Prussia. However, the liberal view makes even Switzerland is not safe anymore for him. In 1758 he move to a new estate at Ferney, located near the French-Swiss border, making it easier for it to run over there or here if there are difficulties with the authorities. There he lived for twenty years, immersing himself in the works of literature and philosophy, passing notes inscribed with the intellectual leaders throughout Europe and received his guests. Throughout those years, Voltaire literature continues to flow endlessly. He really was a fantastic writer with a style, perhaps the most book authors in this book list. All told, more than 30,000 pages a collection of his writings. This includes epic, lyric, personal papers, pamphlets, novels, short stories, drama, and serious books about the history and philosophy. Voltaire always had a firm belief of religious tolerance. When the age of the 60's, there was a ghastly event, concerning the pursuit and pelabrakan against the Protestants in France. Intrigued and outraged, Voltaire devoted himself to the "intellectual jihad" against religious fanaticism. All of his letters always closed with the phrase "l'Ecrasez infame" which means "Down with the bloody stuff!" The definition of Voltaire "damn stuff" is the rigidity and fanaticism. 1778, when age was entered eighty-three years, Voltaire returned to Paris, to watch his new drama Irene. Crowded public shouted "Long live the old master! Life biangnya renewal France!" Thousands of admirers, including Benjamin Franklin, to visit him. However, the age of Voltaire had reached the edge, he died in Paris on May 30, 1778. As a result of anti-church attitude, he did not get a Christian burial. However, thirteen years later, the French revolutionaries who had seized the victory back to dig her grave and buried him in the Pantheon of Paris. Voltaire was writing so much that it is difficult to make the whole list here although the snapper-kakapnya just in this short article. Although so much of his writing, the more important fact that the main ideas put forward during his life. One of the fiercest stance is guaranteed absolute freedom of speech and freedom of the press. Famous phrase that is often attributed to Voltaire who said "I do not agree what you said, but I will defend your right desperately to pronounce it." While it is possible sepersis Voltaire once said it's not, but certainly the sentence that really reflect the real attitude of Voltaire. 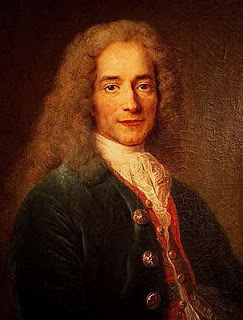 Another is the principle of Voltaire, his belief in the freedom of religion. Throughout his career, he opposed the unshakable religious intolerance and judgment related to matters of religion. Although Voltaire believed in God, he is firmly opposed to the majority of religious dogmas and the solid he said that the organization is based keagaman basically a fraud. Is very reasonable if Voltaire had never believed that the French titles of nobility in itself guarantee the quality advantages, and basically everyone actually understand that the so-called "sacred rights of the King" is actually nonsense. And although Voltaire himself away from the pieces of a modern democrat (he is inclined to approve a form of empire but had strong renewals), the principal thrust his ideas clearly oppose any power that is obtained based on lineage. Because it is not surprising that some of the biggest pro-democracy followers. The idea of ​​politics and religion is thus in line with the schools of the renewal of France, and is an important contribution to the outbreak of the French Revolution in 1789. Voltaire was not a scientist, but he put a great interest in supporting science and empirical view of the persistent attitude of John Locke and Francis Bacon. He is also a serious historian and capable. One of the most important work is a book concerning the history of the world's Essay on the Manners and Spirit of Nations. This book is different from the general description of the history that never existed before in two respects: First, Voltaire acknowledges that Europe is only a small part of the world as a whole, so he focused most of his observations on the history of Asia. Secondly, Voltaire considers that the history of culture is - in general - is much more important than political history. Book itself has more to do with socio-economic conditions and development of art rather than a matter of the kings with all sorts of wars. Voltaire was not close to original as philosophers that there are some characters in this book list. To some extent he departed from the views of others such as John Locke and Francis Bacon, reinforce their opinion or popularize them. Through the writings of Voltaire was, more than anyone else, the idea of ​​democracy, religious tolerance and intellectual freedom to expand throughout Europe. Although there are other important writers (Diderot, d'Alembert, Rousseau, Montesquieu and others) in the renewal of France, Voltaire considered more worthy leaders of all of them. He was a prominent leader of the movement. First, yangmenggigit literary style, his long career, and his writings are so many disciples who did not hook tertandingkan by writers everywhere. Second, his ideas are completely characterized by its novelty. Third, Voltaire precede other important figures from the point of time. Great works of Montesquieu The Spirit of the new Law was published in 1748; the first volume of the famous Encyclopedie was only published in 1751; Rousseau's essay was first written in 1750. Letters on the English while his Voltaire already appeared in 1734 and he was famous sixteen years before the book came out. The writings of Voltaire's Candide with the exception of a short novel reads very few people now. All of his books and read widely dispersed during the 18th century, Voltaire therefore hold an important role to change the climate of opinion which eventually culminated in the outbreak of the French Revolution. And its influence is not only limited in France: Americans like Thomas Jefferson, James Madison and Benjamin Franklin is also well acquainted with his writings. Voltaire is interesting to compare with famous contemporaries friend Jean-Jacques Rousseau. Voltaire that all rational views. more influential. Instead, Rousseau more original and more influential in his own times.